We would like to thank you for meeting with representatives from the disability community on Thursday, July 25 to commemorate the 23rd anniversary of the Americans with Disabilities Act (ADA) and would like to take this opportunity to summarize our recommendations. There are gender inequalities that exist among people with disabilities as there are in general; women with disabilities are less likely to have jobs than their male counterparts, their wages are lower than their male counterparts and they have greater difficulty accessing basic healthcare services than males with disabilities. Issue rules related to improving employment opportunities for people with disabilities under section 503 of the Rehabilitation Act of 1973. Secretary Solis concluded a public comment period in February 2012 following a Notice of Proposed Rulemaking on these rules. This action, which would establish a goal of a 7% employment rate[i] for people with disabilities among for federal contractors and subcontractors, will result in real job opportunities that people with disabilities urgently need. Establish a pilot program that builds on the changes of the Affordable Care Act to allow people with significant disabilities to increase their earnings without losing access to critical long-term services and supports typically offered only through programs like Medicaid. Access to these critical services and supports is contingent upon meeting the Social Security definition of disability and keeping gross earnings under a threshold[ii] which precludes employment and perpetuates the cycle of life-long poverty. Mandate enforcement of Section 508 of the Rehabilitation Act of 1973 [as amended in 1998] by departments and ensure that all electronic and information technology is accessible to people with disabilities. This action will expand opportunities for people with disabilities and an aging workforce by having software and information and communication systems that include the inherent capacity to reasonably accommodate any employees’ physical, cognitive or sensory abilities. Consolidate the responsibility and centralize the funding within departments to make it more efficient to provide accommodations for federal employees with disabilities. This will help to eliminate the inefficiencies that are inherent when local hiring managers are charged with the unfamiliar, and often unfunded, responsibility of making reasonable workplace accommodations, as well as remove economic disincentives from the hiring process. We identified additional steps the Administration can take to promote economic opportunities for people with disabilities and ensure that they lead meaningful lives as part of their community. Improve coverage of wheelchairs, communication devices, hearing aides and other medical devices that facilitate functional independence of people with disabilities and promote their social and economic integration and inclusion. Re-examine the companionship exemption rules prior to OMB promulgation with input from the disability community. Presently, exemption rules of Fair Labor Standards Act for home care workers and personal care assistants are being finalized by the OMB; many in the community believe that this action was taken without sufficient input by the disability community. Reauthorization of the Workforce Incentive Act (WIA) is long overdue and vitally needed if we are to help people of all ages but especially youth who are transitioning from adolescence to young adulthood to enter the workforce with the necessary education, training and experiences to launch them on a trajectory of meaningful careers and economic growth. Your strong, proactive and vocal support of WIA’s reauthorization will be crucial to its ultimate passage. Help to ensure that youth with disabilities have greater more opportunities to develop leadership skills through youth leadership summits and training opportunities. These opportunities will help young people with disabilities connect with peers on a national level, develop an understanding and appreciation for the disability rights movement, enhance leadership skills and build a sense of unity across disability groups. Finally, we are grateful for your stalwart support of the Convention on the Rights of People with Disabilities (CRPD) and for your leadership for sending the treaty to the Senate. Advancing the rights and opportunities of people with disabilities domestically requires that we maintain our unwavering commitment to the equality of all human beings. Ratification of CRPD is an essential public affirmation of our human and civil rights. 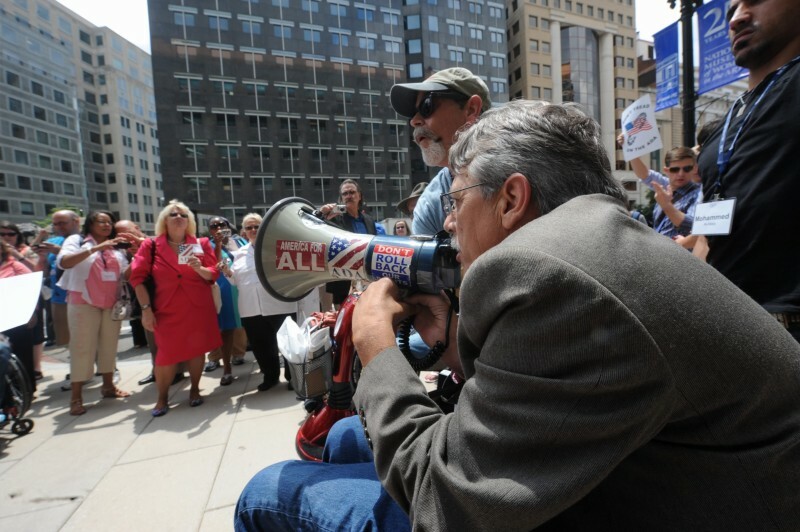 We urge you to utilize your authority to convene veterans groups and business leaders during the August Congressional recess to brief them on the importance of this treaty and to energize their support of human rights and economic benefits that come with worldwide adoption of the tenets of the ADA found within CRPD. We thank you again for your time and leadership and look forward to strengthening our collective efforts with you to improve the growth of the middle class and the economy for all Americans. [i] Surveys of and direct experience with dozens of federal contractors by the National Organization on Disability indicate that many can readily reach the 7% goal for new hires, while others are prepared to and all should be tracking employees with disabilities just as they do women and racial and ethnic minorities. We believe that it is imperative to create a climate that is receptive of a person’s choice to disclose their disability.